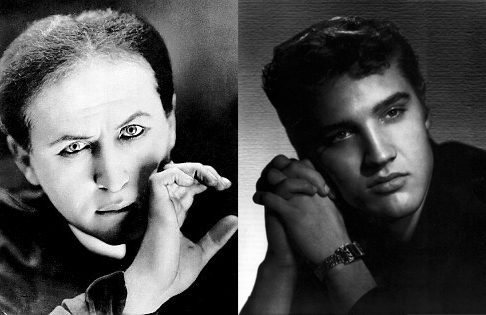 What do Harry Houdini and Elvis Presley have in common? Yes, they were both great entertainers, but that's not it. Yes, they are both legends today, but that's not it. Yes, they both were movie stars, but not what I'm looking for. Yes, they all came from humble beginnings and made it to super stardom, but that's not it either. Yes, they both died young, but that is also not it. They clearly have a lot in common. 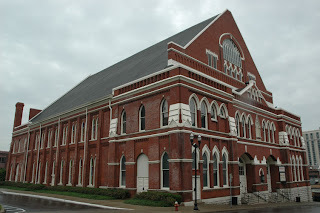 But the one thing I am referring to is a little place called The Ryman Auditorium in Nashville, TN. They both performed there on that stage...at different times of course. The Ryman was once the home of the Grand Ole Opry. Houdini played the Ryman on March 11, 1924. His act was called "Houdini on Spooks" and it was "an Expose of Fakery and hocum by the greatest trickster of the age". If you go to the Ryman Auditorium website and follow their timeline to the proper date, there is a photo of the ad used to sell the show. I think it's from a newspaper, but also possibly a flyer that the Ryman put out at the time. It unlike any Houdini ad I've seen before, though he seems to have had a lot of different styles of ad when he promoted his Exposure of Fake Mediums Act. Houdini presented his Water Torture Cell along with the Spirit Exposures. I'd bet he also did the Needles as that was a signature piece for him. But the thing that fascinates me was his talk on the Bell Witch. I was unaware of what or who the Bell Witch was. Turns out in the early 1800s, the John Bell family was haunted and frankly tortured by a ghostly spirit they named the Bell Witch. This happened in Adams, Tennessee, which is just east of Clarksville and north west of Nashville. It's believed the Bell Witch was the spirit of Kate Batts, a neighbor who John Bell had a dispute with when she was alive. She was not a witch, though many 'unusual events' of that time period would have the term 'witch or witchcraft' attributed to them. The Bell Witch actually attacked the family, by pulling hair, slapping faces and some believe causing the death of John Bell. The ghost stopped it's manifestations in 1821, but said it would return seven years later, and it did. Then it made another claim that it would return 107 years in the future and visit upon the descendants of John Bell. We don't know whether or not this happened, though some speculate the spirit still lives in a cave on the Bell property. That's the Bell Witch story in a nutshell. Houdini, being who he was, surely did not believe a word of it. 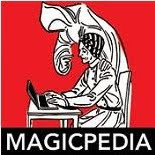 I checked his book "A Magician Among The Spirits" but saw no reference to the Bell Witch phenomenon. Did he offer an exposure of the Bell Witch events? I do not know. My guess is that he used the Bell Witch story which was very familiar to those folks in Nashville, to lure them in and then proceeded with his usual exposures. Interestingly, while searching for more information on this I came across a book called Other Worlds: The Bell Witch and the Stratford Haunting by Barbara Michaels in which Houdini is one of the main characters and he actually speaks to a group about The Bell Witch phenomenon and other ghost stories. It's a work of fiction, but interesting that Houdini would be a main character talking about the Bell Witch Ghost story. Speaking of Nashville, Houdini was in Nashville 25 years earlier in 1899. 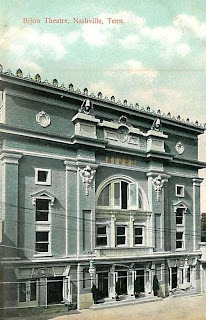 He performed at the Grand Opera House on what was then 423 N. Cherry St. (4th Avenue N today) and shared the bill with another magician by the name of Sigmund Neuberger, better known as The Great Lafayette. It was during this time that Houdini gave Lafayette a little dog as a gift. That dog, who he would call Beauty, would become Lafayette's traveling companion, co-star and best friend in real life. But 1899 was also the year Houdini was beginning to make a name for himself. In St. Paul MN earlier in the year he met up with Martin Beck who turned his life around. Houdini would now feature his handcuff escapes and began challenging the local police departments to provide cuffs he could not escape from. 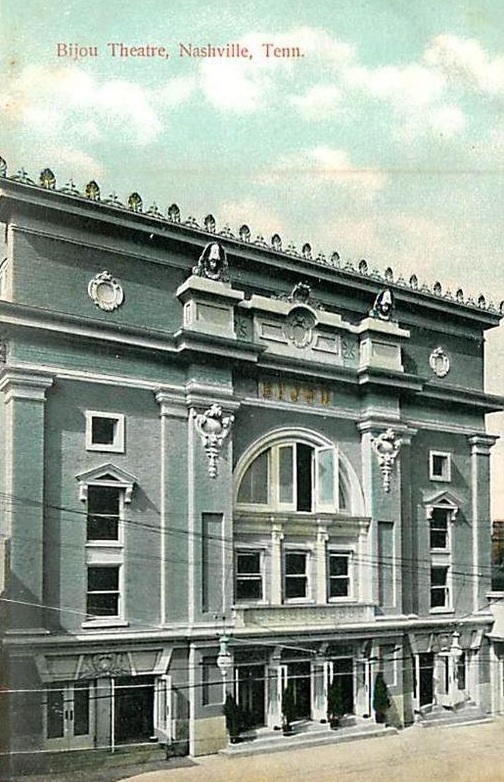 The New County Jail and the Police Station were only two blocks from the Grand Opera House (which later was the Bijou). And the Cumberland River was also right there as well, so I wonder if Houdini ever did a bridge jump in Nashville? 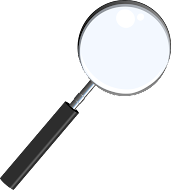 So far I've not found a record of it. One thing is for sure though, Houdini's scheduled one week of performances in Nashville was held over for an additional week. This happened to him constantly that year. Finally, when Houdini appeared at the Ryman Auditorium, he was well established and at the height of his career. When Elvis Presley appeared at the Ryman he was just starting out. According to the Ryman website he sang "Blue Moon of Kentucky" and he received halfhearted applause from the audience. Like Houdini, he only performed at the Ryman once. And also like Houdini, though his early days were a little rough, his career would soon take off and when it did he shot to the top! It just occurred to me but something else these two icons have in common is that their fans and devotees and even some just remotely interested still flock to their graves and still recognize the day they died. Fantastic find! Thanks. Good job connecting Other Worlds. Thanks John. Next time I'm in Nashville, I'm going to go over the Ryman and see if they have the Houdini flyer there.